There are many ways that we are grounded in the spirit world. We are all on a spiritual journey that begins at birth and will continue until it is time for us to leave this world. Each one of us are God’s creation, we are given gifts by our creator at birth. We were given two wonderful gifts. The energy and spirit of love that makes up our being. We are also given the gift of free will and sent into a world that is at times dysfunctional. God also promises us that he will walk along side of us on our journey, all we have to do is ask for God’s help and messengers will be sent to help and guide us. The world was created with resources for all of us if we would only learn to share and respect the earth. 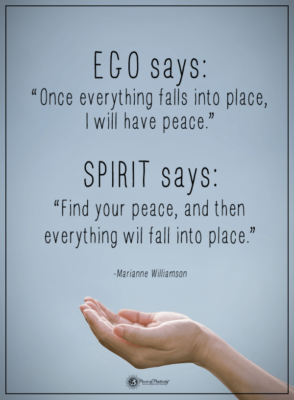 Yet because of our humanness we will experience the struggles, between the spirit and the ego. Our ego at times consists of pride, greed, lust and control. Our spirit tells us to share, forgive, heal and be open to God’s will, not ours. Our intellect will try to control our spirit. Remember, intellectual spirituality will not be enough. Knowing what to do and doing it are not the same. Doing leads to experience and if we are open to the spirit, our experiences will become our strength. We are taught that all growth comes through struggle. One of the dangers to spiritual growth is to be lazy and expect others to do it for us. True humility is probably the most difficult virtue to realize. The three most powerful energies for spiritual growth are to live the spirit of gratitude, humility and acceptance. Each day that we are on this earth is a special gift from God. Take time each day to be grateful for the gift of life, have the humility to be open to God’s will and try to accept the struggles and lessons of the day. At night, thank God for the day’s journey with an attitude of gratitude. As part of our daily inventory, ask some simple questions of yourself. Am I aware of my defects of character? Am I willing to give credit where credit is due? Do I give God credit for the accomplishments of the day? Do I have an attitude of gratitude for all of God’s lessons? We live in a world that emphasizes the negative; we face the false God’s of pride, lust, money and power. Do we have the strength to face them with a spirit of sharing, respect, serenity and humility? I would like to share from two special spiritual prophets. Walt Whitman, “To me every hour of the light and dark is a miracle” & Kahlil Gibran, “The Lust for Comfort, that stealthy thing that enters the house a guest, then becomes a host, and then a master”. These lessons remind us not to take anything for granted. We are taught so many beautiful lessons each moment of life’s journey. There are no coincidences, everything happens to try to awaken our spirit. So much of the hardships of the world are caused by the false gods. All of the great emperors did not last because they were based on greed and power. Scripture tells us not to base our life on material things. The only way is to be in touch with our inner spirit (our soul). In time, all material things will come to an end, but our spirit and energy of love will pass on to all we touch. Each one of us is God’s messengers. Take time to remember each day to pray, meditate and fill your soul. Be people of service to others. Always remember that if we take time to love, honor and respect and care about ourselves then we will have these gifts to share. We carry God’s spirit by the way we live our lives. The greatest teachers are the one who is open to be taught. We are never done learning and being open to the lessons of life. Our ego at times tries to reason and ask the question, why? Many times in anger I wanted to change the world. God reminds us that we live in a world filled with human nature. The negative ego wants power and control. Our positive ego along with our spirit tells us that change comes from the bottom. Our spirit tells us to carry a message of love, healing and forgiving. Look at history ~ Empires built on power, greed and lust, where humans play God, all come to an end. Because of our humanness we need to be people of faith and trust remembering that God is in charge. Once again, we are reminded that we are powerless; we must come to believe faith and trust in a higher being, who guides us. Finally, we need to let go and let God. Let’s try to practice a simple formula for life. Each morning ask for guidance in prayer. Be open to God’s will and just try to face each experience as a teachable moment. Don’t try to figure life out, just live it! Remember that even our dark moments will in God’s time find the light of peace and understanding. Through all the struggles of this world will prepare us for our journey to the unseen world. Share your love to all you meet, knowing that we have been sent into this world to pass God’s love to others, so they can share it with others. May God bless all of us as we walk the journey of life. Don’t worry about changing the world. Let’s learn to love and care for ourselves, so we can share by example.